• A sudden decrease in your vision. Floaters and flashes in themselves are quite common and do not always mean you have a retinal tear or detachment. However, if they are suddenly more severe and you notice you are losing vision, you should call your ophthalmologist right away. Who Is At Risk for a Torn or Detached Retina? • Weak areas in the retina that can be seen by an ophthalmologist during an eye exam. Your ophthalmologist can diagnose retinal tear or retinal detachment during an eye examination where he or she dilates (widens) the pupils of your eyes. An ultrasound of the eye may also be performed to get additional detail of the retina. Only after careful examination can your ophthalmologist tell whether a retinal tear or early retinal detachment is present. Some retinal detachments are found during a routine eye examination. That is why it is so important to have regular eye exams. A retinal tear or a detached retina is repaired with a surgical procedure. Based on your specific condition, your ophthalmologist will discuss the type of procedure recommended and will tell you about the various risks and benefits of your treatment options. 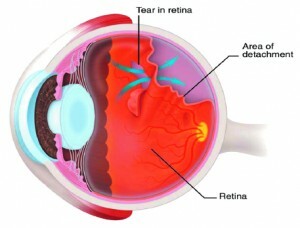 Most retinal tears need to be treated by sealing the retina to the back wall of the eye with laser surgery. Both of these procedures create a scar that helps seal the retina to the back of the eye. This prevents fluid from traveling through the tear and under the retina, which usually prevents the retina from detaching. These treatments cause little or no discomfort and may be performed in your ophthalmologist’s office. Laser surgery (photocoagulation). With laser surgery, your Eye M.D. uses a laser to make small burns around the retinal tear. The scarring that results seals the retina to the underlying tissue, helping to prevent a retinal detachment. Almost all patients with retinal detachments must have surgery to place the retina back in its proper position. Otherwise, the retina will lose the ability to function, possibly permanently, and blindness can result. The method for fixing retinal detachment depends on the characteristics of the detachment. In each of the following methods, your Eye M.D. will locate the retinal tears and use laser surgery or cryotherapy to seal the tear. This surgery is commonly used to fix a retinal detachment and is performed in an operating room. The vitreous gel, which is pulling on the retina, is removed from the eye and usually replaced with a gas bubble. Sometimes an oil bubble is used(instead of a gas bubble) to keep the retina in place. Your body’s own fluids will gradually replace a gas bubble. An oil bubble will need to be removed from the eye at a later date with another surgical procedure. Sometimes vitrectomy is combined with a scleral buckle. If a gas bubble was placed in your eye, your ophthalmologist may recommend that you keep your head in special positions for a time. Do not fly in an airplane or travel at high altitudes until you are told the gas bubble is gone. A rapid increase in altitude can cause a dangerous rise in eye pressure. With an oil bubble, it is safe to fly on an airplane. Most retinal detachment surgeries (80 to 90 percent) are successful, although a second operation is sometimes needed. Some retinal detachments cannot be fixed. The development of scar tissue is the usual reason that a retina is not able to be fixed. If the retina cannot be reattached, the eye will continue to lose sight and ultimately become blind. After successful surgery for retinal detachment, vision may take many months to improve and, in some cases, may never return fully. Unfortunately, some patients do not recover any vision. The more severe the detachment, the less vision may return. For this reason, it is very important to see your ophthalmologist regularly or at the first sign of any trouble with your vision.